Dr. Vladislav V. Yakovlev is a professor in the Department of Biomedical Engineering at Texas A&M University and Fellow of the Optical Society of America, the American Institute of Medical and Biological Engineering and the International Society for Optics and Photonics. His research focuses on the development of new instrumentation for biomedical diagnostics and imaging. 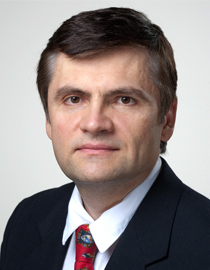 Dr. Yakovlev’s primary research interests include biomechanics on a microscale level; nanoscopic optical imaging of molecular and cellular structures; protein spectroscopy and structural dynamics; bioanalytical applications of optical technology and spectroscopy; and deep-tissue imaging and sensing.